Kikima is in the country of Kenya. Kenya has a population almost the same size as Canada with 34,000,000 people. It is located in Eastern Africa, straddling the equator, and is bordered by the Indian Ocean and Somalia to the East, Uganda to the West, Tanzania to the south, and Sudan and Ethiopia to the north. Kikima is south of Machakos, and on a clear day Mount Kilimanjaro can be seen from the mountain top of Kikima. Despite bordering some very politically volatile countries Kenya has remained relatively stable. The political violence following the elections in 2007 resulted in a brief period of violence and unrest which were immediately brought to the attention of the world community and quickly remedied through government action and collaboration between the parties that were in dispute. It was a British Colony and gained independence in 1963. Subsequently it went through various forms of political upheaval before becoming more democratic. Despite the recent political unrest it is seen as one of the most stable countries in Africa. Its capital, Nairobi, is the base of operations for most of the continent’s Non-Governmental Organizations (NGO’s), and the operations of most United Nations services throughout Africa. Nairobi is a bustling city which has all the amenities available in any modern city, but is also coping with dramatic growth in population without the accompanying funds to support the construction of infrastructure or housing to accommodate this growth. Kenya has, depending on how they are divided, between forty and seventy tribal groups speaking different languages or dialects. Many of these groups are inter-related and have many common features of culture and language. Generally they can be seen as being part of three major language groups; Bantu, Nilotic and Cushitic. Two of the largest tribal groups, the Kikuyu (22% of population) and Kamba (8%) are Bantu, while the second largest group, the Luo (11%) and probably the most visibly known group, the Maasai, are members of the Nilotic group. There is far less emphasis on tribe and a great deal of intermarriage with the younger generations. This generation tends to see themselves as being ‘Kenyan’, rather than tribal. However, these tribal divisions are often exploited by the political process and political parties tend to be tribally based. While there are many languages the two official languages are English and Swahili (Kiswahili). These languages are spoken by the vast majority of people and an English speaking visitor is almost guaranteed to be able to communicate with people throughout the country. In addition to these two languages, which are taught in schools nation-wide, almost without exception every person speaks a third, local/tribal language. It is very common that people are tri-lingual and not uncommon to meet people who have mastered four or five languages and have some familiarity with other dialects. Kenyans, as a whole, highly value education and are highly language adept, easily and effortlessly switching between languages. The town of Kikima is one of four major towns, along with Tawa, Mbumbuni and Kalawa, in the Mbooni district. Mbooni is primarily an agricultural community with the majority of people, approximately 85,000, residing in small clusters of homes or in individual homes and small scale farms. While almost all of the roads in Kikima are rough, rutted dirt and gravel, there is now a paved road linking Kikima to Nairobi. Most of the local roadways still however are extremely rough, severely marked by erosion, under-maintained, often clinging to the sides of mountains, and during the rainy seasons can become completely un-passable due to flooded river crossings, and road conditions which halt even four-wheel drive vehicles. Transportation is by private buses, known as Matatus, private cars and trucks, bicycles and, most often, by foot. Movement of people and goods within the region, and to places external, remains one of the greatest challenges and impediments to growth, agriculture and commerce. In Mbooni, as with agriculture in almost all of Africa, there is a complete dependence on rainfall for irrigation. There are two rainy seasons – a shorter period in March, and a longer period in October – when an overabundance of water is available. During these periods overflowing rivers, washed out roads, erosion and roads that become quagmires are common. The mountainous terrain has been extensively terraced to protect against erosion and retain water from these times of over-abundance. For the remainder of the year rainfall, and thus water, is rare, and people rely on a few springs, oft-times failing creeks, and a few small scale water conservation projects. Often people – almost exclusively women and children – are forced to walk many kilometres to find water for drinking, washing, and agricultural purposes. The land itself is very rich, the climate favourable for growth, and the people are willing to work hard, but the lack of available water limits the potential to grow food and be self-sufficient. Poverty, and hunger, are defined to a large part by the availability of water. Mbooni is mountainous and is at elevation. As such the temperature is not extremely high and nights are often chilly with morning mists very common. In the winter (July and August primarily) it is not uncommon for night-time temperatures to fall to within 5 to 10 degrees above freezing. Summer daytime temperatures however can easily rise into the high twenties and low thirties. Other than during the rainy seasons it is very uncommon for there to be any rainfall and the skies are bright, clear and sunny. Being so close to the equator there is very little variance in terms of length of day throughout the year. Generally the sun rises around 6:00 – 6:30 in the morning and sets again at a similar corresponding time in the early evening. Kikima has recently been named the District Headquarters for the region, and has a population of approximately 10,000 people. 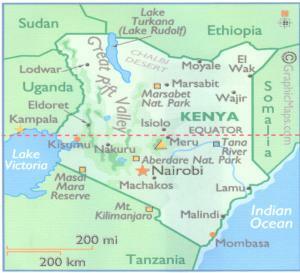 It is located approximately 150 kilometres south-east of Nairobi, at Longitude 37 degrees east and 1 degree south. It is hoped with this change in status that a paved road will soon link this community to Machakos and then to the Mombasa Highway to Nairobi. It was only in 2009 that Kikima was linked to the power grid of the country and electricity was made available to those who could afford it. Still the vast majority of people live in poverty and without electricity or running water. Through local initiatives, there is fresh water available to some homes and many have water retention systems – rain water harvested from roofs and stored in large containers. The vast majority of the people in the whole Mbooni region are Kamba. They speak Kikamba as well as English and Swahili. There are a number of local churches which form hubs of activity and community development within the area.